My friend Lola is one seriously classy broad. Her fondness for flagons of cider aside, this girl is effortlessly chic, with her own individual taste and style. She’s also kind and warm and funny as hell, and she knows how to show a gal a good time. So we were expecting big things from her hen party in Belfast last weekend - and Lola’s gorgeous sisters did her proud, with not an L-plate in sight. Instead, we enjoyed a glamorous vintage-themed day packed full of fun events like a cupcake party, spa treatments and dinner at Berts Jazz Evening in the Merchant Hotel. 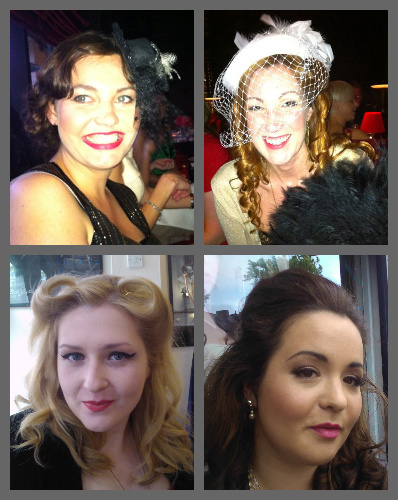 The icing on the cake, of course, was the fabulous vintage makeover session at Ashby Hair Lounge. The girls were fresh from an appearance on the telly where they worked their magic at the Balmoral Show in the King’s Hall. These ladies really know their stuff and they work together on different editorial shoots, TV appearances and, of course, vintage styled weddings and hen parties. From my own wedding a couple of years ago I know there’s a definite gap in the market for elegant, affordable hen options in Dublin but the good news is, they’re prepared to travel. For a seriously stylish wedding or hen party, get in touch through the Facebook page or drop them a line at thevintagebride@hotmail.co.uk. Style through the decades: clockwise from top left, Elle as a 1920s belle, the blushing bride in full on 1940s glamour, Jean as a 50s fox and me in 60s style. Lola - I’m counting the days till the wedding! Aw what a lovely accolade to your friend. Is Lola her actual name? How cool! Looks like a brilliant night and a great idea for a hen party. Wow, you all look seriously amazing! Beautiful ladies. Look like tremendous fun! Especially love the lack of devil horns, L plates and willy straws! That's a brilliant idea for a hen, Em - I LOVE Eleanor's look especially. You look very glam - the hair is fab on you. I love this idea!! Definitely my kind of hen! This looks GREAT! I want to go!